Luckily, Reason writers Nick Gillespie and Matt Welch – they of the Free Minds, Free Markets persuasion – have co-written a new book which recognizes this preference, celebrating our modern world, one of competing luxuries and increasingly expressive and diverse individuals that have prevailed in spite of the less and less responsive industry that is government. 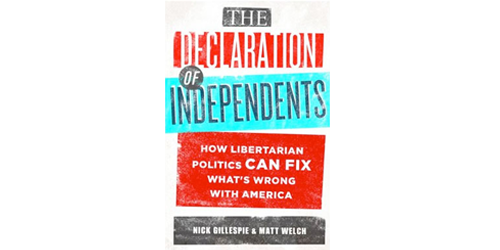 The Declaration of Independents: How Libertarian Politics Can Fix What’s Wrong With America stresses the importance of life outside of politics while noting and applauding the increasing movement of independent voters that hope to maintain and expand these actions, a book written with such skill, thought, and optimism that it is not only politically inspiring, but also stirs the very passions in life that are worth securing. The book is to some degree Chicken Soup for the Libertarian Soul – a metaphysical construct that has actually been documented, a semi-transparent mass to be sure, but a bit more grounded than your average specter…with or without the optional top hat and monocle. While those generally well already persuaded will enjoy the case studies of what has, hasn’t, isn’t, and might work in government, the book aims to reach out to the growing number of self-described independent voters dissatisfied with both the Republican and Democratic parties and more interested in “Pursuing Happiness, Not Politics” as the book’s prologue puts it. The way in which Libertarian Politics Can Fix America is not a dogmatic set of absolutist positions. The authors promote a view of libertarianism that is less a strict definition than a basic tendency or a general trend towards maximizing individual freedoms. The first part of “Declaration of Independents” celebrates the rise of we the mutants, exploring such “Case Studies in Making Life Richer, Weirder, And Better” as deregulation of interstate air travel, legalization of home-brewing, the democratization of the Media, and the truly awesome story of how American Rock ‘n’ Roll helped spur the Velvet Revolution in Czechoslovakia. Given the freedom to do so, people have created more and more particular worlds for themselves and others, helping to make the world a stranger, better, more colorful place. In so many areas of our life, freely competing thoughts and products have benefited everyone by providing new opportunities.